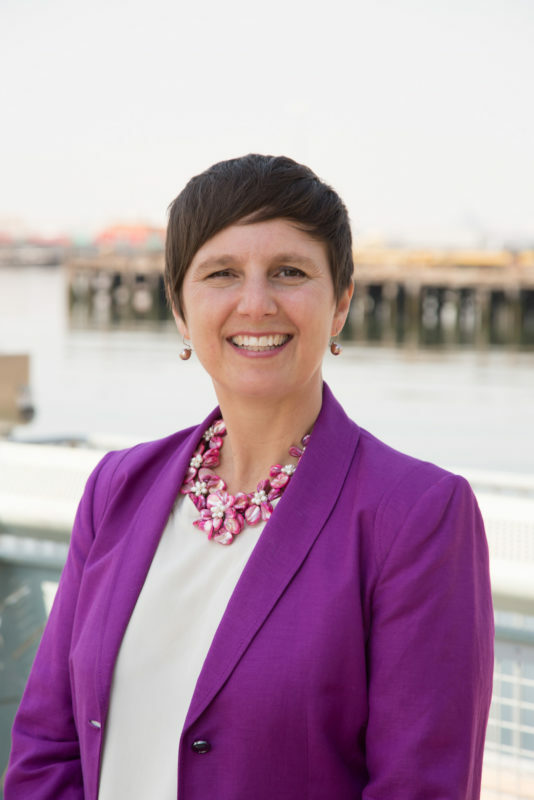 BROOKLYN, NY – The Brooklyn Greenway Initiative (BGI) Board of Directors announced on Monday that Terri Carta has joined the organization as its first executive director. This is a major milestone in the strategic plan BGI developed in 2016 to build upon its prior success moving the vision for a 14-mile landscaped pathway along Brooklyn’s dynamic waterfront from concept to reality. Ms. Carta was chosen from among three excellent finalists in an extensive search. BGI’s search committee consisted of three current BGI Board members, one former BGI Board member, and two others with long familiarity and involvement with BGI. Ms. Carta spent 19 years at Central Park Conservancy, most recently to establish its Institute for Urban Parks in 2014 and serve as its Associate Vice President. A native of California, Carta served as a Peace Corps Volunteer in Guinea, West Africa with a watershed conservation project. She holds an M.S. in Ecological Teaching and Learning and a B.S. in Conservation Biology. She lives in Clinton Hill with her son, who is also a regular Greenway user and loves to ride his bike. Ms. Carta is excited to bring her experience in community engagement and public space management from New York City’s Central Park to the Brooklyn waterfront. “As a Brooklynite and user of the Greenway I want to help realize its full potential as a critical connector of people and neighborhoods, a component of New York City’s sustainability and resiliency plans, and a support for community and economic development for all waterfront residents,” she said. BROOKLYN GREENWAY INITIATIVE (BGI) is the 501c3 non-profit organization committed to the development, establishment and long-term stewardship of the Brooklyn Waterfront Greenway. When complete, this 14-mile, off-street, landscaped, cycling, running and pedestrian route will connect 200 acres of regional parks and numerous neighborhood parks and open spaces from Greenpoint to Bay Ridge. Founded in 2004, BGI works with community, non-profit, business, and governmental partners to create and fulfill a comprehensive vision for the Greenway, while at the same time building awareness and support among the 500,000+ residents who live along the route of the Brooklyn Waterfront Greenway. Six miles of the Brooklyn Waterfront Greenway that has been completed to date and a 1.7-acre public space, the Naval Cemetery Landscape at the Brooklyn Navy Yard, are actively used by hundreds of thousands of people annually. The completed Greenway includes one of Brooklyn’s most heavily used bicycle commuter paths along Flushing Avenue. Planning and design are underway for four additional Greenway segments as well as the two-acre Columbia Waterfront Space, which will provide a “green” connection between Brooklyn Bridge Park and Red Hook and comprise the northern end of the Red Hook flood barrier system. New Greenway segments will incorporate design and engineering to support NYC’s goals for coastal resiliency and storm water mitigation. Please find link to full press release here!